Poppy seeds are great sources of taste as well as good health .They are a very good source of calcium and acts as cooling agent. Poppy seeds protects heart against cardiovascular diseases. Poppy seeds with sugar can be taken to cure insomnia. 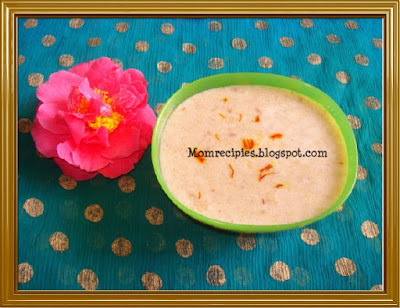 This Payasam /kheer is good for mouth blisters, cools the system and induces sound sleep. * Soak khus khus, badam and kaju overnight in water. * Add copra and grind them to a fine paste. * Add 2 tbsp cold milk & grind very fine. * After it boils, add the paste, stirring well to prevent lump formation. * When it starts boiling, simmer for 10 mins for the khus khus to cook well. * Keep the flame low, add sugar, cardamom powder & edible camphor if using. * After sugar dissolves completely mix well then add milk with saffron before removing from the fire. * Garnish with roasted nuts and raisins . * Khus Khus kheer is ready! Serve it either hot or cold. I have not had payasom for such a long time. Wish i could grab that bowl.